What To Do With That Celery Juice Pulp! For all of us on the celery juice train or movement, I am sure we have all experienced this or thought about this, especially in the beginning. What do I do with this pulp I have leftover after juicing my celery? So here we go on with some ideas…..
First I will start with a few things I have done. I have put it in a soup that I made with potatoes, onions and carrots, etc. And then turned it into a creamy soup by blending it. Very yummy. Use garlic too and you increase the health benefits. It’s a very soothing soup. I’m saving the pulp for veggie broth plus onion skins, a bag of carrot pulp, and other veggies I froze. Gonna boil them up and can into quarts. Sometimes mix it into pet food….or I make muffins out of it …my friends love them . I add it to my smoothies. My Client’s Success with Celery Juice!!! 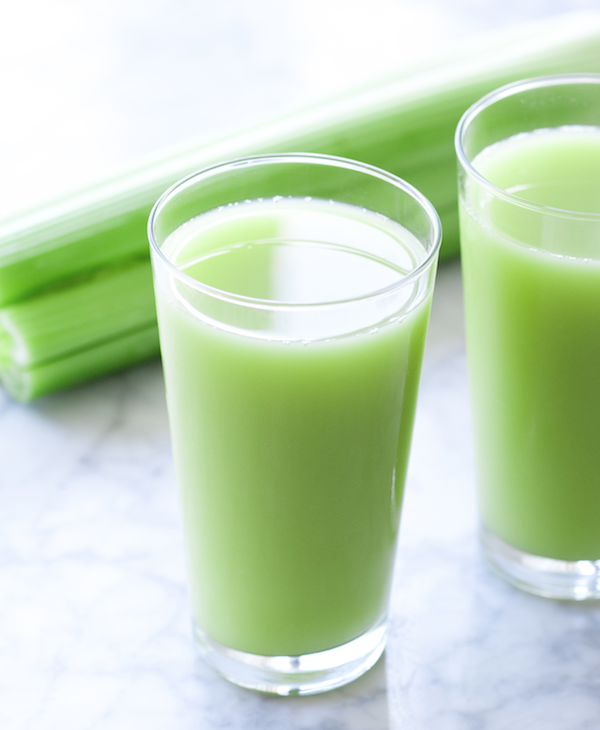 Celery Juice is the latest health hack and for good reason. People everywhere are drinking their daily 16 oz of celery juice and seeing tremendous benefits especially with digestion. I am very happy for my client. She was a little apprehensive about trying the celery juice at first, but now she is addicted! 🙂 We often keep each other posted about which grocery stores in town have the best celery in stock, with the best price, etc. I thank Anthony Williams, Medical Medium, every day for introducing the world to this natural medicine that is helping people every day all over the world. There are countless stories and pictures on Instagram, Facebook, and all over the web. Maggie Holbik.com is a Board Certified Nutritionist and Certified Life Coach who loves to think outside of the box and is open to the many gifts that nature offers us to support our wellness of body, mind and spirit. I saw this great 12 Reason guide today for why to drink celery juice and thought it is a must share! Your liver’s individual immune system relies on the undiscovered types of sodium cluster salts inside of celery. For more information on celery juice and how it can help you heal, refer to Anthony’s book “Liver Rescue”. Maggie Holbik.com is a Board Certified Nutritionist and Certified Life Coach who LOVES the work of Anthony Williams and Spirit. She is an advocate of spreading the message of celery juice and it’s amazing ability to heal. En-JOY the day and remember the little things do count! 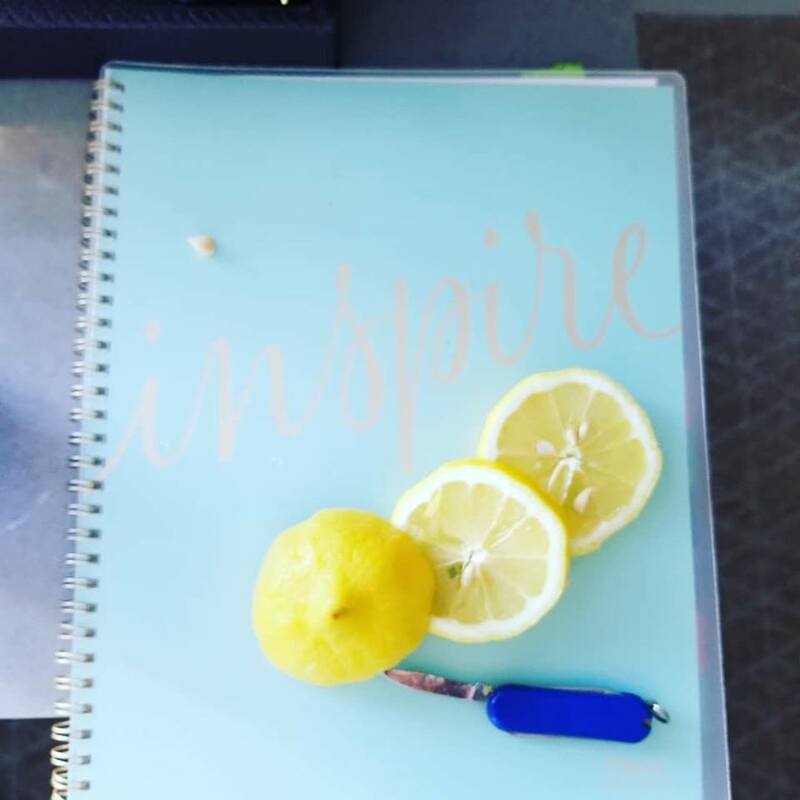 Stay inspired…..
Maggie Holbik.com is a Board Certified Nutritionist and Certified Life Coach who is like everyone else on their journey… plugging away, having ups and downs, but trying to be consistent in small healthy changes that can make a big difference. She hopes you find inspiration to add in things into your daily routine that can help to increase your wellness of body, mind and spirit. When it comes to juicing or just getting good nutrients into your body, anything goes! This morning I had my straight celery juice and then shortly after had this combo. How did I come up with it? I opened the fridge and voila… I picked from some things that were in there. 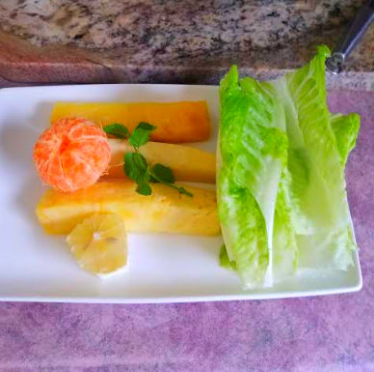 Romaine Lettuce, 3 large pineapple spears, a piece of lemon I needed to use up, an orange, and then I grabbed a small sprig of mint from my indoor mini herb planters. I threw it in my juicer and it was delicious!!! You really cannot go wrong. I often smile when I see the endless juicing books out there. Sure they are great for ideas and targeting health benefits but in all reality just take some things that are good for you and throw them in! Anything goes! Get creative. 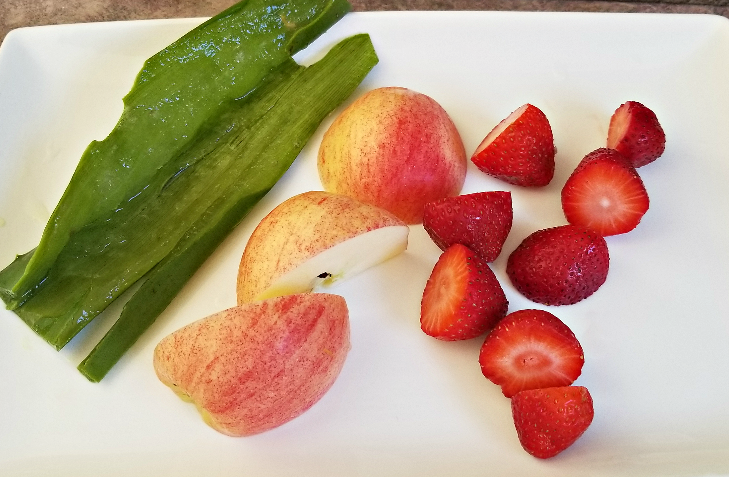 This was my second round of juicing today… some gel from my filleted aloe leaf, strawberries, and apple. Once again it was yummy! Recently I did a cooking demo at an Esthetics School and we were making Hemp milk. I accidently dropped in an extra date and more vanilla than ‘my recipe called for’. It was perfect. I told the class that it does not matter… throw in more, less, other things, change it up…. anything goes. Adapt and adjust as you go along. It’s all good. Maggie Holbik.com is a Board Certified Nutritionist and Certified Life Coach who enjoys adding in more good things into her life. She is of the mindset that life is precious and our time is always shorter than we think so it is of the utmost importance to fine tune each and every day to the things that matter most. On a side note, many of you have asked me about the best juicer. While there are many juicers out there and I have tried several smaller ones that I have picked up at thrift stores, I was lucky enough to get one of these Hamilton Beach 800 watt ones at a thrift store brand new. I loved it so much that I just yesterday, bought a second one from Lowes to have at my beach house where I work. I love this juicer. It’s easy to clean, has an amazing yield and saves me so much time. I really think it’s the best value for a mid-range juicer.